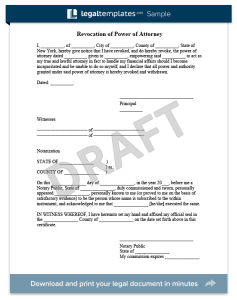 Use our attorney-drafted NJ Power of Attorney (POA) to designate another person as your agent to legally act on your behalf. In accordance with N.J.S.A. 46:2B8-1, et seq., a New Jersey power of attorney is an important document that is meant to empower a person or persons, referred to as an agent(s) or attorney-in-fact, to act in the capacity of another person, referred to as a grantor or principal. The document allows the former to “step into the shoes” of the latter. While the state of New Jersey does not have an official power of attorney form, the Division of Taxation provides the similar “Appointment of Taxpayer Representative” form, or Form M-5008-R. This form, however, is very limited in its scope to tax-paying delegation by the named principal. That said, you can find many templates online, or you may draft your own form tailored to your specific situation. A proper document must also outline any specific provisions that apply to the agent, such as compensation for the performance of duties, the right to delegate responsibilities to any third party, and the appointment of a successor agent in the event that the agent is unable or unwilling to complete his or her expected duties. The power of attorney (POA) sample below gives “Agent” Ann M Foust the authority to make financial decisions in the event that “Principal”Ariel R Bush is incapacitated. Ann has the authority to handle issues dealing with Ariel’s property, stocks, insurance, and business. real estate, financial transactions, estate and trust matters, businesses, disability and retirement benefits, and tax matters. N.J.S.A. 46:2B-11 goes into great detail describing all banking responsibilities bestowed upon a given agent. However, in New Jersey, the principal should indicate specifically in plain terms within the text of the document which powers he or she wishes to delegate to the agent, or which actions are allowed to him or her as a fiduciary. This could mean including particular language with regard to specific areas, or only checking off particular paragraphs that apply when dealing with pre-made forms. The power of attorney laws changed in New Jersey with the introduction of the Revised Power of Attorney Act, codified at N.J.S.A. 46:2B-8.1, et seq., on December 8, 2000. The new statutes provided principals with many more rights while imposing stricter guidelines on agents, as well as increasing their responsibilities. All powers of attorney now must be recorded in writing. The document must state which powers will and won’t be affected by the subsequent disability, incapacity, or incompetence of the principal. All powers of attorney remain in effect until the principals revoke them, and third parties are to assume that they are in effect until they receive a notice of revocation or the principal dies. In New Jersey, in accordance with N.J.S.A. 46:2B-8.7, a principal has the discretion to choose more than one agent to act on his or her behalf. He or she may appoint two people, and decide whether they act together to make joint decisions in the principal’s best interest, or whether they can each act alone without the consent of the appointed co-agent. The latter choice can get messy, and though the law does provide for it, it is not recommended by many attorneys because any disagreement can lead to litigation if it is not handled timely. Another point to consider is that unless he or she is appointed by a properly-executed power of attorney, a spouse does not have the automatic legal right to handle the other spouse’s affairs in the event of incapacity. Spouses will not be able to access 401(k) or IRA accounts, speak with Social Security, deal with the Motor Vehicle Commission, or mortgage or sell any real estate. Without a power of attorney prior to the would-be principal becoming incapacitated, a guardian would need to be appointed by the court. A general power of attorney – This document authorizes the agent to perform any financial transactions on the principal’s behalf. A limited power of attorney -This special document restricts the agent to one or more particular tasks, such as selling a vehicle while the principal is out of town. A standard power of attorney – This document terminates when the principal becomes incapacitated. A durable power of attorney – This document is any power of attorney form that specifically states that it is not affected by the subsequent incapacity, disability, or incompetence of the principal. Language must plainly indicate that this is the case, or the power of attorney will terminate after such an occurrence. It is effective for the lifetime of the principal. A springing power of attorney – This document only takes effect after a specified event occurs, such as the principal’s incapacity. If the agent(s) chosen by the principal turns out to be untrustworthy, or if he or she decides not to take on such an exhaustive role, the power of attorney document can be legally revoked in New Jersey. The statute, N.J.S.A. 46:2B-8.3, when changed in 2000, states that a power of attorney may terminate under its own terms, or when the principal revokes it. In order to do so, in accordance with N.J.S.A. 46:2B-8.10, the principal must sign a written revocation and destroy each original copy of the document. Drawing up a new power of attorney does not revoke a previous one. If the steps above are not completed properly, in accordance with N.J.S.A. 46:2B-8.5 and 8.6, a power of attorney will legally remain effective until each third party receives an official notice of revocation, or until the principal dies. A healthcare power of attorney is a specific durable and springing document that allows an appointed person the right to make health care and end-of-life decisions for another individual once that person is unable to make such decisions for his or herself; often in conjunction with a living will. In accordance with N.J.S.A. 26:2H-53, et seq., what is called an Advanced Directive for Health Care in New Jersey, must be signed and dated by the principal, as well by two witnesses that declare that he or she is “of sound mind and free of duress and undue influence.” In order for the document to become effective, the principal’s physician must determine, confirm, and document a lack of decision-making capacity.